If you are a counselor, pastor, student, one-another minister, small group leader, or spiritual friend, you want to know the most helpful books about biblical counseling—using God’s Word for helping hurting people. Here, in alphabetical order, are the top 17 books published in 2017 about biblical counseling, written by a biblical counselor about Christian living, or important to biblical counselors. I’ve selected these books on the basis of their biblical depth, relevance to life, practicality for one-another ministry, faithfulness to the sufficiency of Scripture, application to progressive sanctification, and by surveying what leaders in the biblical counseling world are saying about them. As Christians, how should we think about psychiatric diagnoses and their associated treatments? We can’t afford to isolate ourselves and simply dismiss these categories as unbiblical. Nor can we afford to accept the entire secular psychiatric diagnostic and treatment enterprise at face value as though Scripture is irrelevant for these complex struggles. Instead, we need a balanced, biblically and scientifically-informed approach. In Descriptions and Prescriptions, biblical counselor and retired physician, Mike Emlet, gives readers a helpful way forward on these important issues as he guides lay and professional helpers through the thicket of mental health diagnoses and treatments. 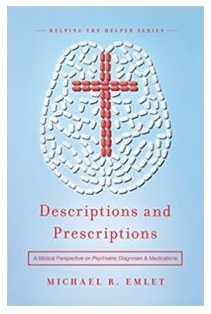 Descriptions and Prescriptions is a clear, thoughtful primer in which the Bible informs our understanding of psychiatric diagnoses and the medications that are often recommended based on those labels.